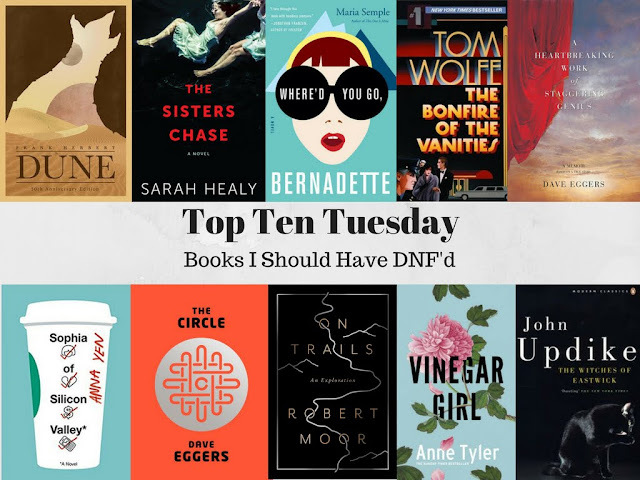 Top Ten Tuesday is a weekly linkup of book bloggers hosted by That Artsy Reader Girl! A few weeks ago, we talked about books we didn't like but were glad we'd read anyways. The actual topic for this week are books we decided to stop reading too quickly. I almost never DNF (do/did not finish) my books, but there are some that if I'm being honest with myself, I should have because the book did nothing for me. Where'd You Go Bernadette: I knew almost as soon as I started reading this that the tone was a mismatch for me. That never changed. Bonfire of the Vanities: I'd previously read and hated Tom Wolfe's The Electric Kool-Aid Acid Test and I should have bailed when I started this and realized within like 50 pages I hated this too. Instead I read the whole thing and hated every second of it. On Trails: I've actually got a pretty rocky history with the books my book club reads, but I love the group so much so I stick with it. This was last month's read, and the scattered way the information was presented was something that annoyed me pretty quickly and then just never stopped annoying me. This is a minority opinion, though...my book club overwhelming liked it! The Sisters Chase: This was another book club selection and holy smokes it was awful from the first page all the way to the last. This time everyone else in book club agreed. Sophia of Silicon Valley: If you're going to like this book, you have to really be rooting for the titular Sophia and given that I thought she was terrible from the jump...it did not work out well. Vinegar Girl: The gender politics of The Taming of the Shrew are hard to update to the modern world, and the wit and snap that would make it work do not materialize. Skip this egregiously bad book and watch 10 Things I Hate About You. The Witches of Eastwick: The movie version of this book is a cheesy 80s delight with some genius casting. The book, which I was surprised to find out was written by the legendary John Updike, was a dull, tortured plod and never got good. The Circle: I was so excited for this book before I read it...a 1984 for the social media generation? Sign me up! But then it fell SO. FLAT. Lazy characterization, clunky dialogue, and the least interesting plot choices made. Though I'm always honest when asked for my opinions, it's very rare I'll actively discourage someone from reading a book. This is one of the few exceptions. A Heartbreaking Work of Staggering Genius: Two Eggers in a row...my practice with any given author is that if one book doesn't work for me, it's just as likely to be a weaker offering or just the wrong book at the wrong time as it is to be that I'll never like that author. Two, though, and I give up. Why I made myself suffer through this simultaneously anxious and boring book before I wrote off Eggers for myself I can't quite understand. Dune: This space opera hits like 100% insanity right away and I do better when there's a little more world-building first. Ooh, I like this spin on the topic! I would have had an easier time with this approach. And yeah, Dune is the worst. I opened Dune up and like ten pages in was like "what in the world am I reading?" and then it continued on for hundreds of pages. I get confused when I meet people who've read the sequels because honestly I barely forced myself through the first one. No thank you to more! Great spin on this topic! I agree, Vinegar Girl was terrible. I only finished it because it was so short, but I came very close to throwing it across the room. I'd heard good things about it and kept waiting for it to get good because surely it must stop being so very bad at least...and about halfway through I realized it was just going to keep being bad :( Glad to hear I'm not the only one! It makes me sad you didn't like Bernadette, but I understand. I considered doing a post for this week's topic, but honestly, how do you if you stopped reading a book too quickly?? You won't have read the part you didn't read to know if you should regret not reading it?! Anyway - I like your spin on it much better! Sad to see Bonfire of the Vanities and Bernadette on your list, though! Yeah I thought it was tricky as-written (maybe like the books that you still wonder about sometimes? ), but since I never DNF I had to change it up anyways! And I wish both of those books had worked for me too! I'd been looking forward to them! I have only read a couple of these (they, too, weren't my cup of tea) so I am honestly not surprised that you wish you hadn't finished. The others that I haven't heard of, or haven't read, make me glad that I haven't bothered with them to be honest. I trust your judgment on these! Great list. Thanks! There have definitely been books that started out shaky that ended up being great, and that's one of the reasons I cling to my never-DNF stance, but there are ones that make me wish I'd cut myself a break every so often! I'm honestly kind of curious about the movie version...mostly because the idea of Tom Hanks in the lead role is mind-boggling! I also wasted my time with The Circle. I just found it so tedious (and whatever it had to say or was trying to say about the power of the internet was way behind the times and totally pointless). His writing style flows alright for me I guess, so I was able to finish it and didn't realize how annoyed I was until after, but the characters and plot were all very flat, as you said. I loved Where'd You Go Bernadette, but really didn't enjoy Today Will Be Different. I'm not usually one to get pulled out of a book because the conversations people make me think "no one really talks like that", but I found myself constantly cringing at the dialogue in The Circle. I know some people absolutely love Dave Eggers, but he's not for me. As much as the book didn't pop for me, I'm actually looking forward to the movie version of Bernadette! The cast seems incredible and I think the humor will translate really well to screen.